Yoga is a technique of spiritual development of Indian origin who had been the outstanding 5000 year ago. The word ‘yoga’ comes from Sanskrit, means union and aims to unify body, mind, and soul. Many people think that yoga is a fitness, and therefore, they are lazy to practice. This is because they are based at the practice of yoga are available at fitness places. At the moment, they see that there is a yoga’s instructor doing difficult movements, they become discouraged, because that is in their brain is “I can not”, “The movement was very difficult”, “Body I’m not flexible”, and so forth. Though the practice of yoga is quite easy and very beneficial for health if done regularly. A yoga master said: “There is no need to be perfect in the practice of yoga, each person has their own portion, so no need to push yourself, just do a routine in accordance with your abilities, there will surely be useful later.” So the important thing is the intention, and because of the many yoga poses, you can just choose whichever movement you need. 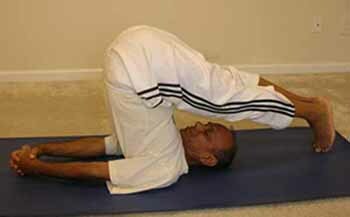 The practice of yoga is very good for maintain health, because body & soul are intimately connected. There are so many benefits that can be taken by practicing yoga postures ranging from trains to change bad habits. By exercising with a regular body everyday, blood circulation will be smooth, long and irregular breathing, digestion becomes better, the people in all organs to function properly, increased vigilance and awareness. Maintaining health with yoga exercises better than taking drugs to restore health. Sure.